Is Etruscan muifu even a word? Looking at TLE 228 (aka ET Vs 7.10), I'm seriously questioning the validity of the transliteration commonly given. The word muifu is a hapax and, in my view, doesn't even look like a properly shaped word. I suppose it's a form like CuiCV that throws me off since I see it nowhere else in my database. However, there's another reason and this is why it's handy to have a notepad to doodle in if you like geeking out like me on ancient languages. When I write out muifu in Etruscan letters I can't help but think that there's a subtle misspelling going on. There's often room for interpretation in poorly preserved inscriptions, especially when authors don't endeavor to show pictures of the inscriptions they're talking about because an artifact was stolen or due to obstructive copyright issues (which is, as always, very frustrating to me). What look like upsilons to some may be lambdas to others. The comparison below is between the actual transcription (as per Helmut Rix, for example) with the implied letter forms in Etruscan and an alternative suggestion that I'm contemplating. By changing two letters, we can see how things could have been misinterpreted: an original lambda may look like an upsilon, an original theta may look like an Etruscan ef. Furthermore, the benefit of presuming mliθu instead of muifu lies in another Tomb of Golini inscription, TLE 221, where we already find mliθuns. In that case, mliθu and mliθuns would merely be two declensional forms of the same word and we'd no longer have an irritating hapax of mystery hampering our translation efforts. This is another rant about hideous Proto-Indo-European roots still reconstructed in the 21st century that should have been dumped in the 1960s along with Woodstock. I love Proto-Indo-European (PIE) and am fascinated by it but I also hate unjustified reconstructions and "junk linguistics". On that subject, let's now talk about (*)*ǵalak- or similar forms designated as the PIE word for 'milk' in addition to the more substantiated root *melǵ-. I don't think a person truly understands PIE until they recognize the myriad of shoddy reconstructions out there in its name that need to be dismissed. We have Greek γάλα (gen. γάλακτος) & γλάγος 'milk' along with Latin lac 'milk' (gen. lactis). Based primarily on this, Douglas and Adams have reconstructed *ǵl̥lákt- , have then attempted to add dubious cognates from Indo-Iranian loaded with assumptions, and have concluded (or merely asserted without firm basis rather) that "[...] both the archaic morphological shape and the geographical distribution would seem to guarantee this item as at least a regional word in PIE." In my view, a more reasonable, alternative view is that the Greek and subsequent Latin forms are from Hittite kalaktar meaning more generally 'nutriment' and have nothing to do with PIE at all. This would be one of those Greco-Anatolian Wanderworts which spread during the 2nd millennium BCE along μέλι 'honey' which I've just talked about before. Whether directly or through an intermediary, this must be where internal -kt- comes from while word-final -r has been deleted in the Greek loan. The Latin form must then be from Greek. The word even finds its way into Egyptian as ỉrṯ.t 'milk' (*yarāṯat /jəˈɾɑ:cəʔ/). We know that the word must be from Hittite or similar Anatolian dialect because it can be further derived from the native verb root kala(n)k- 'to soothe, satiate, satisfy'. Reconstructing a protolanguage root that's unanalysable despite an etymology already available with a clear historical source is the kind of sloppy, unacademic nonsense I loathe with a passion. Douglas/Adams, Encyclopedia of Indo-European culture (1997), p.381 (see link). Puhvel, Hittite Etymological Dictionary: Words beginning with K (1997), p.19: "kal(l)aktar, galaktar (n.) 'soothing substance, balm, nutriment'" (see link). Woodard, The Ancient Languages of Mesopotamia, Egypt and Aksum (2008), p.181 (see link). Just to make sure that no one thinks I've suddenly disappeared, I'm letting everybody know that I'm still pondering, still creating, and will be making some new posts shortly. My attention is presently diverted between making a blog redesign (and convoluted Blogger code associated with that task), my attempts at modelling historical things in 3d, tracking down a decent meaning for the Etruscan word aclχa, collecting the details on another potentially contrived PIE root (*)*galakt- 'milk', and a whole bunch of other stuff that has nothing to do with this blog. It's spring afterall and the extra sunlight is making me extra creative after a chilly winter of relative ennui. Hold tight, readers. Numerous irregular deletions of word-final *-it. Wildly defective genitives (*mlitós → Hit milittas, Lat mellis, Gk μέλιτος, Ir melo, Arm melu). Chaotic Anatolian vocalism (Hit milit- vs. Luw mallit-). Shared Greco-Anatolian features (ie. genitive in *-t-os) as if by areal influence. Greek μελίτειον is mislabeled an Iranian term (as per Douglas and Adams). Unjustified derivatives based on just one or two languages (ie. **meluyo- 'bee', **melitih₂ 'bee', **mlit-ye- 'to gather honey', etc.). Total disregard for regular sound laws and accent throughout (eg. *mlit-ye- > βλίττω yet genitive *mlitós > μέλιτος). Finno-Ugric fossilizes early IIr *médʰu- but fails to show any trace of *mélit-. Word vanishes magically in all IE languages east of the Crimea, even in Tocharian. Now, I realized something else that was plaguing my subconscious. There are far too many missing words for 'honey' across Italy that could decisively resolve the issue. Does anyone else notice this convenience? Latin mel with the coincidently unexpected genitive is always cited. Yet what happened to Umbrian? Oscan? Venetic? South Picene? Knowing that translating Etruscan maθ as 'honey' is illegitimate, what is its real term if not none other than *mel? How did so many words for 'honey' vanish in the same geographical area? How can a typical offering to the gods be absent from all pertinent texts in numerous languages? It's rather frustrating to those that care. While we can at least eliminate some potential non-IE sources of this term in the general search area like Akkadian dišpu and Sumerian lal, my mind is intuitively drawn to the poorly understood language of Hattic since linguists keep on finding comestible terms in -it (Hittite sepit-, a type of grain, and Greek alphit- 'barley') that have no decent Indo-European explanation and yet have a strange habit of lingering around Western Anatolia as if substratal. A Hattic term, *melit, had spawned both Anatolian *mélit 'honey'/*mlit-eu- 'sweet' on the one hand and Aegean *meli 'honey' on the other (with *malítʰau 'sweet' via Anatolian). 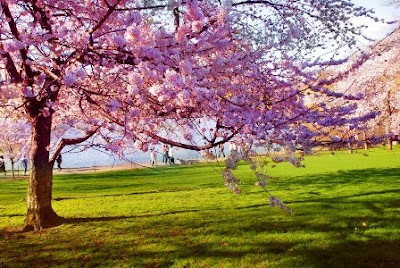 Anatolian languages loaned the Greek reflexes while Aegean gave birth to Etrusco-Rhaetic *mel 'honey'/*mlítʰu 'sweet' which yielded the Latin, Celtic and finally Germanic reflexes (via Celtic) once this branch first arrived in Italy. Then for the pièce de resistance, another Aegean offshoot, Eteo-Cretan, inherited the word *mlítʰu 'sweet', attested by Greeks in the first half of the epithet Britomartis. Interestingly, -it is said to form feminines in Hattic as in hanwasuit 'throne' so could a Hattic form *mel-it be analysed this way too? But dare I say more on this holy day of drunkards. A toast to all: A tall glass o' mead for them stinkin' snakes... then another for them drunkin' shakes. Sláinte! The term maθcva, found three times in the Liber Linteus with inanimate plural -cva, can therefore not be a mass noun like 'honey'. G & L Bonfante were no doubt aware of the grave problem when they abandoned the expected value of *'honeys' based on their very own grammatical sketch for the ad hoc ammendment 'full of inebriating drink'. Unproven, ad hoc, and biased by Indo-European *médʰu-. For me, the usual definition of the word 'troll' needs a serious readjustment. When online, intent is impossible to determine with certainty. They could have a determined intent to be a jerk or they could just be mental. Morality and civility can never be your guide in anonymous environments and is a typical way for trolls to exploit your guilt for 'hurting them' when fighting back or deleting them. They're last tactic is to attack you from another website, but this just makes them look like twits and is free advertisement for you. So when assessing weak links in your commentbox, the only objective criteria is rationality. 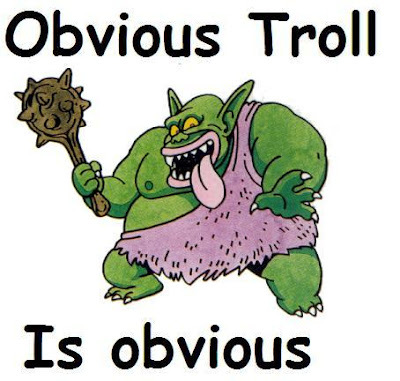 A 'troll' must be redefined as: Anyone **for whatever intent** who constantly exploits logical fallacies. Hold your own. Don't back down. Be merciless. Rip the purposely ignorant apart with glee. 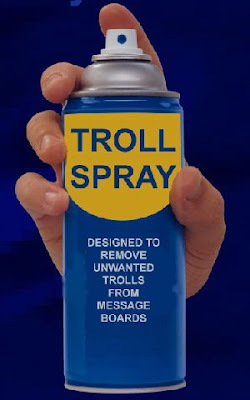 Fallacies are the very bread and butter of a determined troll. It's the bug-spray to kill them dead. This also effectively identifies and zaps yappy children, crackpots, spammers, topic-derailers, and the traditional intentful troll. No self-respecting academic-oriented blog wants anything other than sane adults on their blog. Only sane adults add reader value to a blog. Unfortunately, until laws are in place to jail some of the extreme offenders (watch, it's coming), keep in mind that every website is a troll target. No one is a virgin to troll attacks. It's the idiot that can't defend his position so he hurls invectives like "You don't know anything about [fill-in-blank]". It begs the question why they don't just take their free time to read something better. Answer: they're social rejects. One nut is still posting falsifiable Vasco-Caucasian etymologies to me for months on end. He fails to absorb that each and every one of his messages has been rejected. Maybe it's time for the meds? No, I'm not interested in how you think that Etruscan is related to Mayan or that you took offense to my position against clumsy protolanguage reconstructions. Get lost. These trolls try hard to twist any new idea proposed by the blogger as a logical fallacy without facts to support it in a transparent attempt to interfere with open dialogue. It doesn't matter how often you espouse Occam's Razor or explain that it's only a rational possibility to ponder given the facts. But grown-ups know damn well what you're saying or ask pertinent questions when they don't. These people tend to be flakes who have no ideas of their own and due to their deficiency bitterly try to discredit others simply for sharing ideas to bring everyone down to their brainless level. This is the person that yells "Free speech" whenever you try to shut them up with a deletion or two. Obviously if all commenters are free to blog their own positions, then there is no free-speech issue. The person is just an aimless jerk who is trying to wear down your own inherent freedom to delete his stupidity from your own blog. Such trolls will say that you can't handle opposition and that you hate everyone, blah blah blah. You're told that you're ornery, you're a prick, you're an aspie. They've got every name in the book for you but no facts. Of course, bloggers have a right to object to factless, argumentative opposition from nutty commenters who pretend that they represent everyone when you're clearly only objecting to their own personal views. Hip-hip-hooray for the blessed 'Delete' button! The best technological innovation ever! Memiyawanzi remarks lately on the use of γῆ κατ' εὐρώσσ' 'dank earth below' in the oddly named post Dank earth and ejaculations. It inspires me to take a crack at this interesting and potentially profound concept. For me, the subtle phrase in Greek can be understood as part of a much larger concept that goes well beyond Homer or the borders of Greece, pertaining to the world of the dead as it was once conceived. Hades is described as 'cold', 'dark' and 'watery'. This is equally a description of the literal earth that we dig up when we bury the dead, showing us the analogy involved here and its evolution. The rivers in Hades that are later named (ie. Acheron, Styx, etc.) are relatively recent add-ons to the initial analogy of burial and moist earth. In Ugaritic texts, we read instances of 'filth' in reference to the city of the underworld, directly derived from the image of the deceased being laid to rest in the literal filth of the earth. Hence, the underworld came to be seen by many cultures of the Mediterranean to be cold, dark and moist. This was also the understanding of Etruscans who traded afterall with the Greeks and who absorbed many traditions from the Near East. However, I believe the symbolism goes one step further. The very rites of Etruscans which were designed to divine the future from the internal organs of sheep, themselves imported traditions traced back to Babylonian extispicy, are necessarily built on a lost metaphor of the Earth, not only as cold, dark and moist but also a living deity, complete with innards. From the metaphor of a living earth, ancients reasoned further that the sun, as it passes under the horizon in the west and underneath the earth to rise again in the east, is effectively passing through the bowels of the earth. The way in which the sun passes through the world of the dead below and how it's effectively reborn every morning was a directly significant and life-affirming image to ancient believers throughout the eastern Mediterranean, whether Greek, Etruscan, Hittite or Egyptian. People ancient and modern have mourned their loved ones and often need to believe in a greater purpose to mortal life, sometimes straining to see any hope, even a blind metaphor-induced one. Knowing now the source behind expressions like 'bowels of the earth' and Etrusco-Babylonian haruspical rites, we're armed with the power not only to crack the intended meaning of some obscure Greek texts or comprehend the purpose of some Etruscan artifacts, but we're also capable now of seeing a glimpse into the heliocentric belief system of the Minoans in the same region. 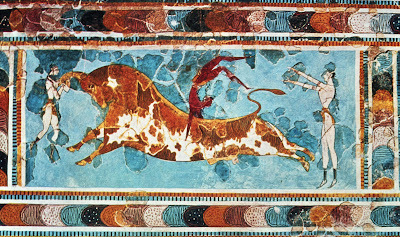 The Minoans left traces in their murals and their stories carried on by the Greeks. The mystery of the labyrinth unravels itself and we recognize it as a representation of the entrails of the earth. The living Earth is the maze of innards. As anthopomorphic goddess, she protects her holy symbol of immortal life within her, the labrys. The Minotaur becomes transparent as Death incarnate (cf. the Ugaritic death god, Mot), with whom Theseus wrestles in the dead of night. Here, Theseus can only represent the immortal, heroic Sun who in Herculean fashion conquers death. We see this not only by his function but also by his non-Greek name built on a Proto-Aegean root *tʰes- 'to dawn' (> Etruscan θesan 'dawn'). The Minoan mural below, tragically described as showing a 'secular' act by some stunted historians, is replete with iconography. The tanned youth representing the sun 'floats' in the air atop the living bull of the underworld between two ladies representing the horizons of east and west and forming the invisible Horns of Consecration (cf. Egyptian aker). In sacrifice, this same bull might be offered to the gods and his organs interpreted by priests just as if the animal were literally Death incarnate, perhaps holding important omens of the future in his murky, dank depths. Compare equivalent expressions in the Semitic world like Ugaritic l-kbd ’arṣ 'in the bowels of the earth' where kbd refers to both the literal viscera of an organism and also metaphorically as the interior of something. Rev C W Jones, On mythology in funereal sculpture in Parker, The archaeology of Rome (1877), p.27 (see link). Nilsson, The Minoan-Mycenaean religion and its survival in Greek religion (1971), 2nd edition, p.374 (see link). 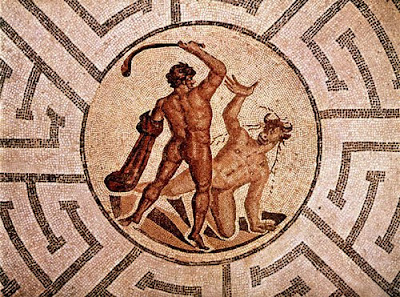 In a failed attempt at erudition, the author dug himself into a corner with a contrived attempt to impose his own atheism on ancient cultures: "It is often assumed that Minoan bull-fighting was a sacral performance, but there is nothing in the Minoan monuments to prove that it was more than a very popular secular sport. "; Renfrew, The emergence of civilisation: The Cyclades and the Aegean in the third millennium BC (1972), p.435: "Whether or not it had a religious origin and significance, which is not certain, these representations are entirely secular in flavour, expressing often the dramatic contrast in the anatomies of bull and leaper." Again, an exaggerated emphasis on secular interpretation of bull-leaping at the expense of a competent and convincing explanation of its source. Castleden, Minoans: Life in Bronze Age Crete (1993), p.168 (see link) laments: "The bull sacrifice was probably a regular occurrence at the temples, yet it is very rarely depicted: the scene with the tressed bull on its sacrificial table shown on the Agia Triadha sarcophagus is a rarity." After exploring some alternative etymologies, some disoriented commenters have tried to warp my intent at open brainstorming into some agenda to ignore onus wholesale. Back to reality, we have the right and obligation as intelligent readers to question what we read and to seek out new ideas. Some ideas may fail. And so what? We get back on our feet and think some more. It's worth it to read, ponder, express and explore. Those that object to this wear their mental stagnation on their sleeve. Ignoring for a moment the topic of Aegean substrate, the fact is that some commonly reconstructed IE roots are poorly attested and some so weakly evidenced that it begs the question why we even call them PIE roots aside from starry-eyed credentialism. Many a hallowed PIE root is built on flimsy evidence and a good chunk of these suspicious terms just happen to form words relating to heavily traded products, with reflexes that hover like a ghost around the Mediterranean. A commonly used cop-out is to label a reconstructed root as "Western IE", which basically means "Ah what the hell, let's shove it in there. Nobody'll notice!" There's of course no meaningful concept behind "Western IE" and in such circumstances, it's perfectly reasonable to suspect substrate influence that is mistaken as PIE inheritance. I certainly don't think that all Western IE roots are to be reassigned to the Aegean family, but I'm reasonably sure that in our ignorance of Minoan and related languages, Minoan history and "Pelasgian" substrate in Greek, there is definitely a noteworthy portion of words stemming from the eastern Mediterranean that are misassigned to PIE in overeagerness, thereby obscuring the linguistic past, exaggerating the importance of one group over many others. Taking Douglas and Mallory's The Oxford introduction to Proto-Indo-European and the Proto-Indo-European world, for instance, it's not hard to compile from it a list of "potentially not IE" roots such as: *wóino- 'wine', *táuro- 'bull', *mélit- 'honey' and *márko- 'horse'. These are words that deserve our skepticism for many reasons. As we can see, *a arises disproportionately in "Western IE" roots. Certainly there are valid roots on the PIE level with *a (since a vowel system without a low vowel is unheard of), but the preponderance of them in "Western IE" roots is what makes the whole thing quite glaring. They're also coincidentally wandering terms relating to animals and trade. I've already talked about the non-IE-ness of *mélit and suggested a possible Aegean source for discussion, but this was based purely on supposition. All I can stress is that just because something is popularly reconstructed in PIE doesn't make it so or obligate us to respect it as a "fact". All the ad populums in the world can't make up for a strange lack of eastern cognates in some of these roots. Finally, in the case of *táuro- it's interesting to note that the word is in fact attested in Etruscan (Θevru-Mineś 'Bull of Minos' [TLE 755]) and therefore could be cunningly used as a means to undermine the PIE reconstruction. In that scenario, Etruscan would serve as lexical intermediary between otherwise suspiciously similar Latin and Greek terms, a notion already accepted by historians to explain other shared vocabulary. Douglas/Adams, The Oxford introduction to Proto-Indo-European and the Proto-Indo-European world (2006), p.89 (see link). Douglas and Adams inadvertently uncovers a problem with this irreproachable hypothesis at the bottom of page 262 of The Oxford introduction to Proto-Indo-European and the Proto-Indo-European world (2006): "The noun *mélit is found widely in the West and Centre (e.g. OIr mil 'honey', Lat mel 'honey', NE mildew [< *'sweet sap'], Alb bletë 'honey-bee', Grk méli 'honey', mélissa 'honey-bee', Arm melr 'honey', including Anatolian, e.g. Hit militt- 'honey') and has one Iranian cognate in the form of a reference to melition, a drink of the Scythians." Naturally we should ask: Why is the distribution of this word west and center? And you've probably surmised that I'm thinking of a possible Aegean explanation for what appears to be nothing more than a wanderword. A more valid PIE root for 'honey' might best be sought in the more-fully-attested root *médʰu, normally assigned the value of 'mead', a wine made from fermented honey. What I'm pondering on is the possibility that only the Anatolian forms for 'honey' are truly Indo-European but which represent some innovative derivative from a native root. From there, Anatolian *mélit would be borrowed into Aegean as *méli with other related borrowings like *malítu 'sweet' (cf. Britomartis) which would in turn be borrowed into Greek. By the onset of the 1st millenium BCE, Proto-Cyprian *meli 'honey' and *mlitu 'sweet' would yield Old Etruscan *mel and *mliθ via early syncope. Once the Etruscans arrived in Italy, the early Latini could have easily borrowed the Etruscan term, thus Latin mel. These terms, along with their Etruscan-derived runes, could then have also travelled eventually to the Germani and among the Celts. That would certainly explain the distribution a lot better than the standard Indo-European-based theory. Phoenix recently relayed a story told him by his teacher of Berber which was in turn recounted to him by an aged Morrocan professor about an interesting coincidence between the names Crete, Kos and Samos and the Berber numbers for 'three', 'four', and 'five'. This fun game of telephone may remind one of how Plato got his hands on the whole Atlantis scoop and how things got blown totally out of proportion thereafter. Lest anyone take the hearsay seriously, I should stamp out that notion quickly. It's merely an idle novelty of factlessness, of course. I'm not sure about the real origins for the name of Crete or Kos offhand. However, I can manage to cut off one of these pernicious tentacles of ignorance by referring to dear Strabo who had long ago alluded to a connection between the name Samos and words for 'high' (Strab., Geo. 8.3.19) which, it turns out, are Semitic. Given its history, the naming of Samos is attributed therefore to Phoenicians and not to the counting proficiency of the Berber.